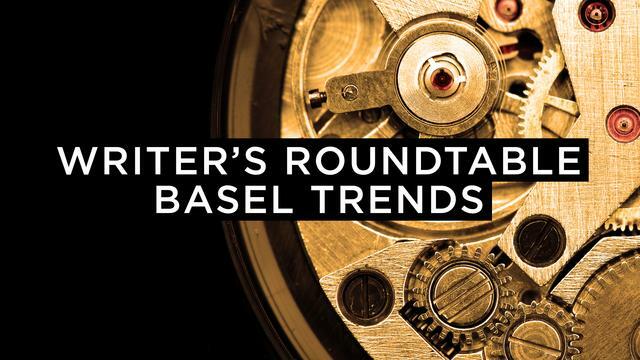 Nearly a week after Baselworld 2016 closed its doors, team iW discusses trends seen throughout the halls. Continue reading for a recap on the world of horology post-basel. At Baselworld 2016, calendar watches were the new moon phase. While lunar complications seemed to dominate the trade show circuit in 2015, the calendar watch genre was ubiquitous at every price point and within every product class. As manufacturers turned their focus to value, this most practical of complications came to the fore. 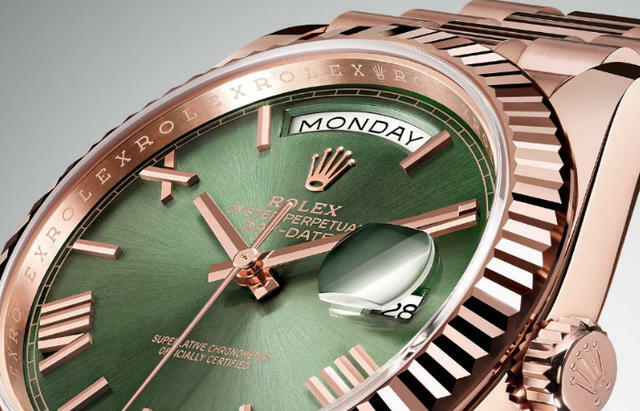 Rolex led the line with two “Rolex Green”-dialed Day-Date 40 iterations in honor of the 60th anniversary of the calendar class’ elder statesman. Based on the Day-Date 40 debut model from Basel 2015, the new rose gold 218235 and white gold 218239 act as a double-barreled tribute to a nameplate long regarded as the unofficial “flagship” of the industry’s most prominent brand. Both examples reprise the core elements of the classic Day-Date (e.g., automatic winding, day window, date window, Oyster case) with the case size (40mm) and 70-hour caliber (3255) that arrived with the Day-Date 40 family in 2015. As with previous Rolex anniversary specials including the 2003 Submariner 16610LV and the 2013 Daytona 116206, the new Day-Date 40 is likely to endure as a standout edition and fixture in its model line. In the upper echelon of complexity and stature, Chopard answered the call with a classic Baselworld “statement” debut. 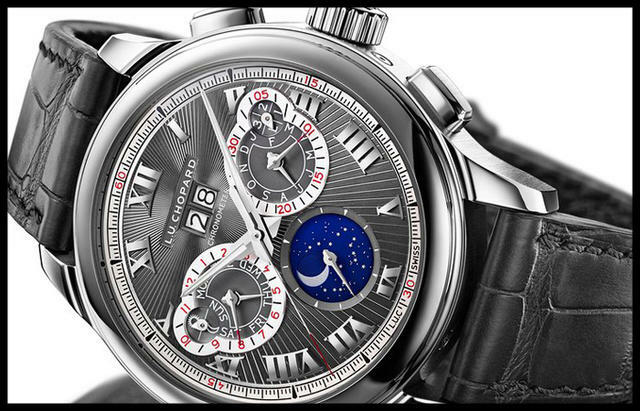 The 20th anniversary of Chopard as a manufacture served as a launch pad for the L.U.C. Perpetual Chrono. A 43mm white gold limited edition of 20 pieces, the Perpetual Chrono combines every thread of modern Chopard know-how. With Geneva Hallmark-levels of finish, C.O.S.C. chronometer certification, Fairmined Gold case material, and a classic column wheel architecture, the Perpetual Chrono and its manual caliber LUC 03.10-L ensure a unique experience for the fortunate few. Chopard completes the impressive package with an elaborate guilloche ruthenium-coated dial adorned with white gold Roman numerals. More than an impressive package, there is a beauty and coherence to the L.U.C. Perpetual Chrono that is exceptional even in this rarefied class of timepiece. The rich textures of the dial, the polished and matte contrasts, and the judicious use of colors creates a true sense of occasion befitting Manufacture Chopard’s two-decade anniversary. Value asserted itself throughout Baselworld 2016, and nowhere was this more evident than at Frédérique Constant. The Geneva-based brand offered a compelling combination of value and capability with the launch of the Slimline Perpetual Calendar. With a complete (day-date-month) calendar, moon phase display, and leap year indicator, the new Slimline Perpetual imposes no compromises in features or functions. Moreover, the caliber FC-775 boasts an in-house pedigree often lacking in this price bracket. Three variants of the 42mm automatic Slimline will be offered in either plated rose gold or polished stainless steel, and the price of admission – $8,795 for the steel variant – represents a real breakthrough for a watch in this class of complication. Frédérique Constant explicitly touts its cause as “accessibly luxury,” and the Slimline Perpetual Calendar delivers on both counts. Whether the reasoning was due to the changes in the economy, adjusting to the consumer’s desires, or improvements in technical processes, watch companies released many more products with value in mind during this Baselworld fair. 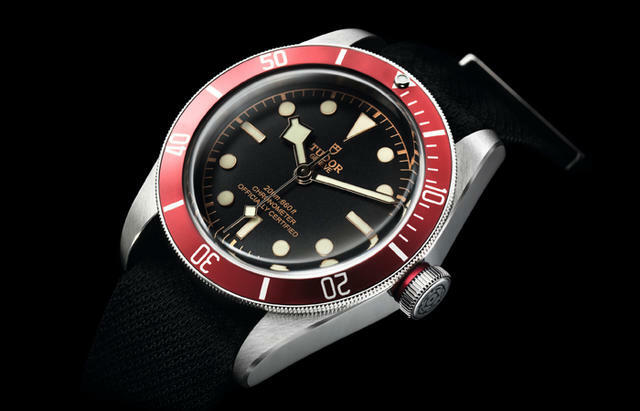 For example, announcements such as the Tudor Heritage Black Bay collection, starting at $3,675, presents an in-house mechanical movement MT5602 complete with COSC certification. The Tudor Heritage Black Bay also won the GPHG Revival Prize in 2014, which adds to its appeal. Might I also add, this 41mm dive watch incorporates historic design cues from the 1950s and looks great on the wrist. Furthermore, Tudor sets up their offerings to attract a broader market with the Tudor Style collection starting at 1,900 Swiss francs, or about $2,150. Manufactures of haute horlogerie also look to expand their customer base by offering a lower entry price point. The stainless steel Nebula from Arnold & Son is a great example. This time-only watch offers in-house manufacture movement, A&S5101, with impressive engineering that creates a precise yet visually appealing design. The skeletonized movement is a mechanical beauty with hand-finishes like chamfered bridges and wheels to beveled screws with mirror polishing, all for $14,500. Additionally, brands like Frederique Constant and TAG Heuer brought tremendous value for money with spot-on releases during Baselworld. 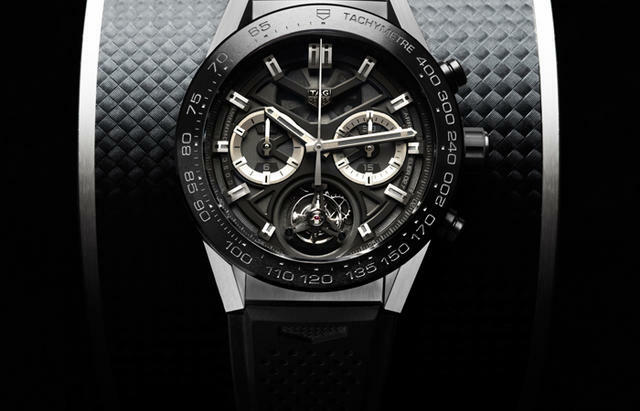 The TAG Heuer Carrera Heuer-02T, a COSC-certified automatic chronograph combined with a titanium and carbon flying tourbillon, signifiigantly drops the price for a tourbillon. A super low price of $15,950 for a tourbillon timepiece and allows more collectors to to get in the game. Frederique Constant continues to create affordable luxury with a Quantième Perpetuel, which keeps the date on track during the short months and through leap years. 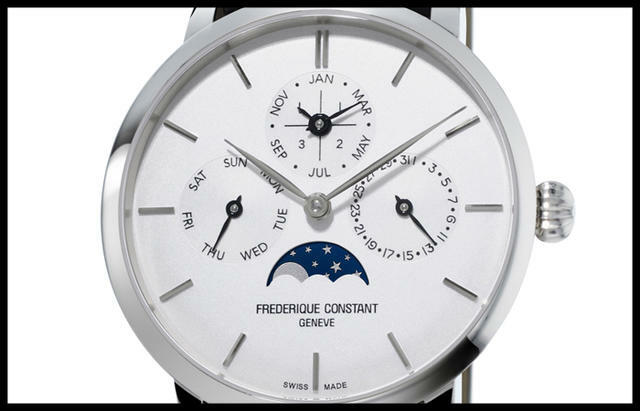 The Manufacture Perpetual Calendar price tag is $8,700 and certainly fits that mold of affordable luxury given that a perpetual calendar typically tends to cost a small fortune. Beautifully decorated dials on ladies watches were evident throughout Baselworld 2016 in the form of miniature painting on mother-of-pearl, stone setting, enameling and even weaving. 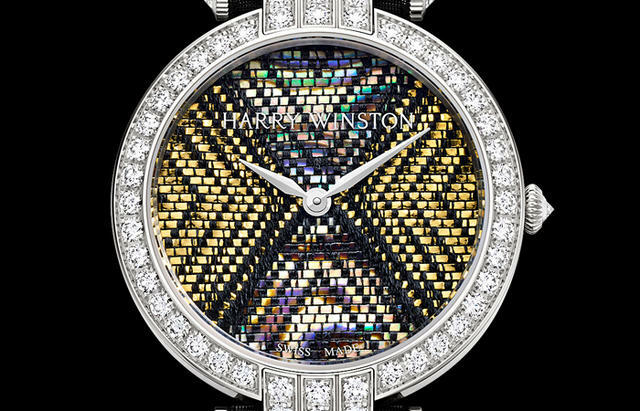 Following are just a few examples of the indomitable artistic spirit ever present in the art of watchmaking. Bulgari’s Lucea has highlighted the house’s artistic crafts on its models since 2013, magnificently reinterpreting a garden theme. 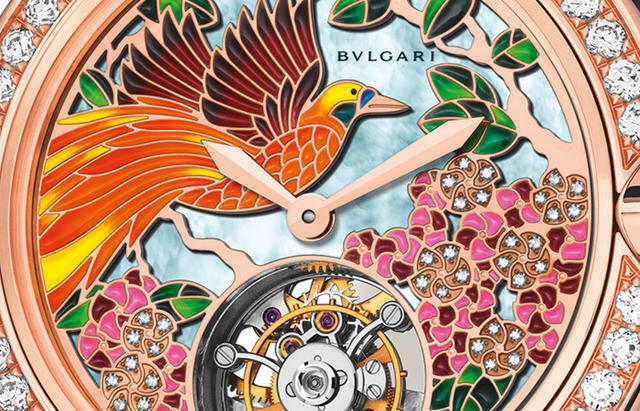 This year’s Il Giardino Paradiso includes two watches with elaborately decorated dials whose flora and fauna décor features a colorful bird of paradise motif on blue mother-of-pearl. 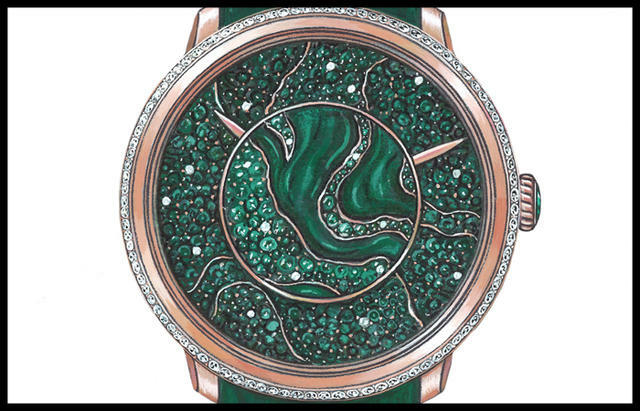 The dial of Fabergé’s Lady Libertine I represents the Zambian terrain, home to Gemfields’ Kagem emerald mine and the source of the emeralds used to decorate this watch. The stylized relief features a mixture of snow-set polished and rough emeralds with fine gold filigree outlining the banks of the region’s rivers. 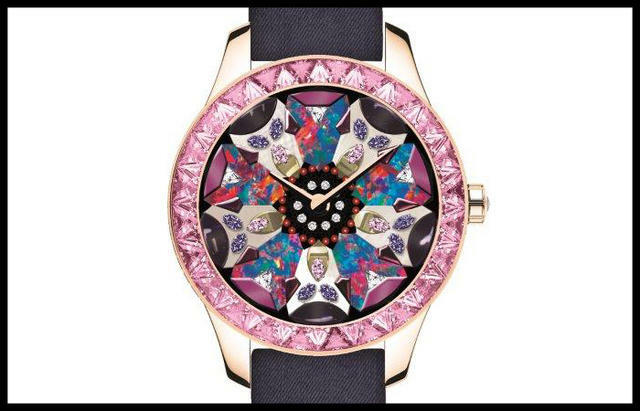 This kaleidoscopic watch dial from Dior is one of eight unique pieces in the Grand Soir Kaleidiorscope collection. The face shown here is embellished with pink gold, yellow gold, sapphires, diamonds, opals, mother-of-pearl and onyx, surrounded by a bezel set with triangle-cut pink sapphires and brilliant-cut diamonds. 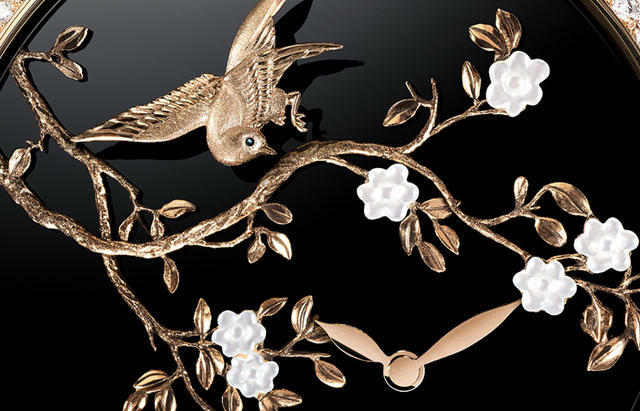 Sculpted gold is a technique used to create the lifelike scenes on the onyx dials of the Mademoiselle Privé Coromandel Sculpted Gold Flying Birds collection, which is inspired by Coromandel lacquer panels. Chanel’s proprietary beige gold is shaped, engraved and oxidized and mother-of-pearl is exactingly cut, resulting in a highly detailed and realistic motif. For 2016, a “trembling” effect has been added, making the birds seem to take flight. At Baselworld 2016 many of the premiere debuts pointedly reference vintage designs. While historical homage is standard practice for any brand proud of a long, successful lineage, this year we saw what seemed like a greater reliance on previously penned case and dial profiles. The result was a show with, all told, fewer truly novel timepieces, at least among the major brands. (AHCI watchmakers as usual broke with this trend, which always makes the AHCI stands a worthy stop during Baselworld. )light with each movement of the wrist. With so many major brand collection anniversaries in 2016, perhaps such a retro-focus was to be expected. In addition, the added pressure of recent and projected economic challenges very likely has watch designers and marketing teams dissuaded from taking too many risks with increasingly wary watch consumers. 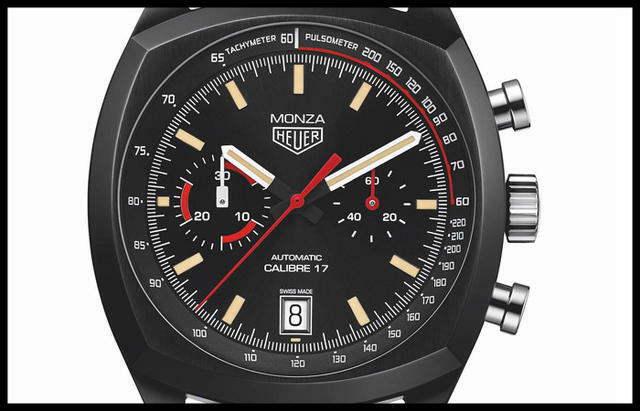 That TAG Heuer Monza Chronograph updates the cushion-cased classic from the 1970s and adds orange SuperLuminova indices and a grade 5 titanium (previously steel) case coated with titanium carbide. The diameter has also been increased (from 39mm on the original models to 42mm). Inside, the Caliber 17 automatic chronograph, with two counters at 3 o'clock and 9 o'clock – evokes even more retro pleasure. 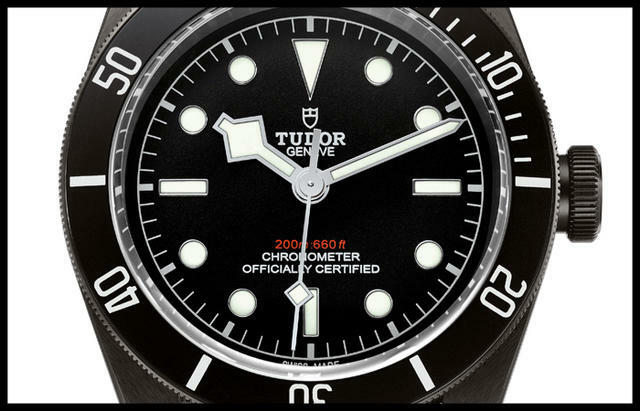 The Tudor Black Bay Dark, as noted above, inherits its profile (especially its domed dial and crystal) from earlier Tudor dive watches. Also prominent is the winding crown that recalls the Tudor 7924 reference of 1958, known as the Big Crown. 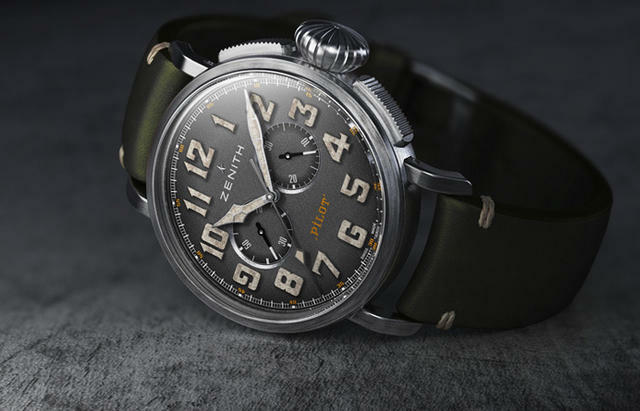 Zenith’s Heritage Pilot Café Racer boasts its vintage bona fides in its name. You decide if its pilot watch forebears fit with a stylized two-wheel racing bike. 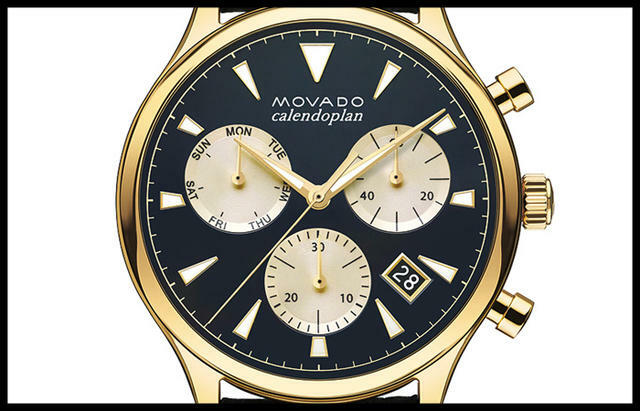 With decades of delicious design, Movado has finally added a ongoing retro-style collection, called Movado Heritage Series, and kicks it off with this Movado Calendoplan chronograph, inspired by a 1950s Movado Calendoplan. The 2016 version features a 43mm yellow gold ion-plated steel case with matching quartz chronograph pushers and crown. 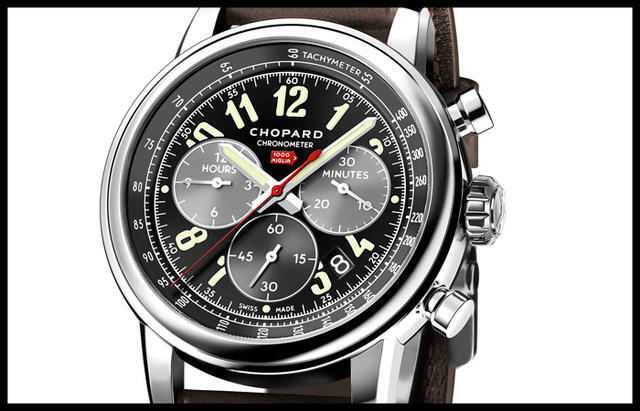 Chopard’s Mille Miglia 2016 XL Race Edition is a generously sized retro-style timepiece issued in a 1,000-piece stainless steel edition. It is clearly inspired by the design codes of the cars that took part in the historical Mille Miglia race between 1927 and 1940. Inside is thoroughly modern COSC-certified Chopard Caliber 03.05-C, a new mechanical self-winding movement equipped with a column wheel.